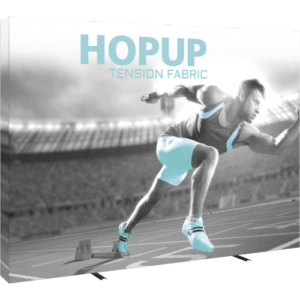 Hopup™ 10ft (4 quad x 3 quad) straight full height tension fabric display is a simple, versatile and easy to set up display. 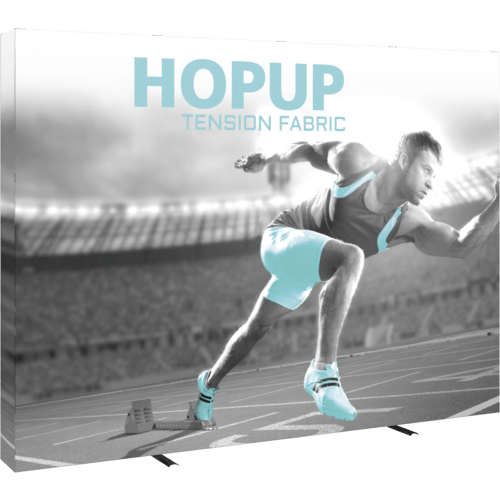 Hopup 4×3 Straight features a lightweight, durable aluminum frame and a Velcro-applied, straight fabric mural with or without endcaps. Simply attach the graphic, pop (expand) the frame and you have a perfect full height display – no tools are required for assembly! A rolling carry bag for storage and transport is included. Option available to purchase the frame only.